When I went to get some satin that matched the fur I already had all I could find was this cinderella blue--too bright for this project. It was trial and error, as satin doesn't accept dye as easily as natural fiber fabrics. I used teal and black but kept adding more black while the satin [one yard] was already in the dye bath, which will give you a mottled look as the dye isn't equally distributed. But, I was happy with the results, both the color and the mottled look, as this project wasn't meant to be perfectly pleated. To begin, take the measurement of your child's waist and use half that, as the pleats will only be in front. Fold the top down an inch and 1/2 and press. Fold an inch back up and press. Repeat until desired width of sash is achieved. I made this one 4", and then used a 1/2" seam when finishing it, so the total width was 3". Here is the key to keeping the pleats in place. 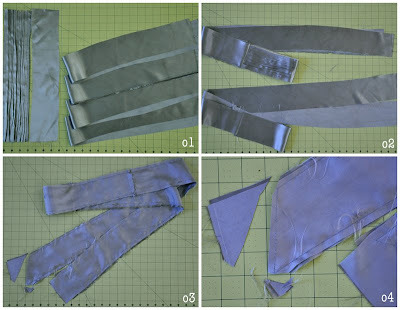 Cut a fusible piece of interfacing the size of the pleated portion of the sash. Dry iron it to the back of the sash, making sure the fusible glue is activated. Now those pleats will stay put! 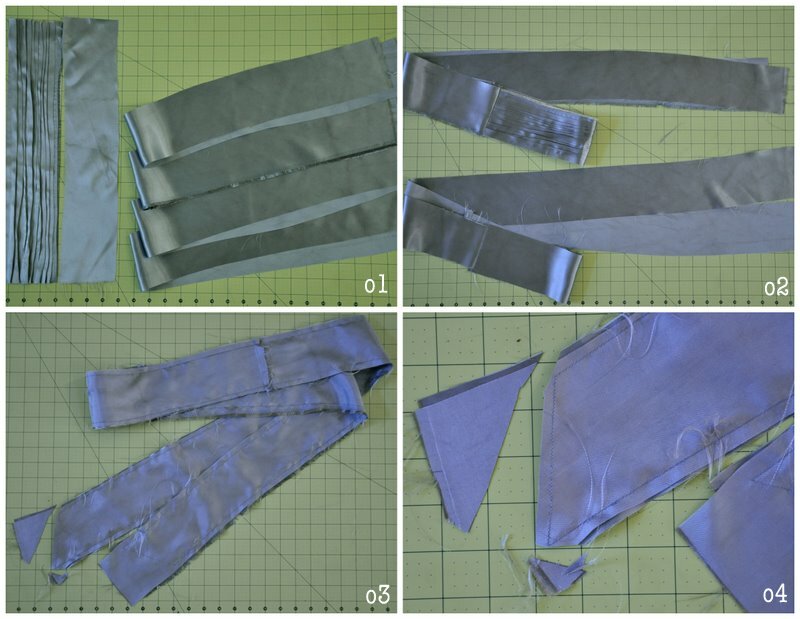 o1 Cut another piece the same size as the pleated portion as well as 4 pieces the same width, but desired length. o2 Sew first two pieces with a tie on each side. Press seams away from the center. o3 With right sides together, sew the two sashes together. Leave a 3" opening and sew the ends at a 45 degree slant. o4 Trim corners and turn right side out. Press and hand stitch opening shut. Here is the layout for the muff. Once again, I used flannel backed satin. The shiny side should face the furry side of the...fur, with the batting in the back. Having the satin an inch shorter will make sure it fits without showing when turned right side out. Stitch 1/2" down the 12" sides, leaving each edge 1/2" open. 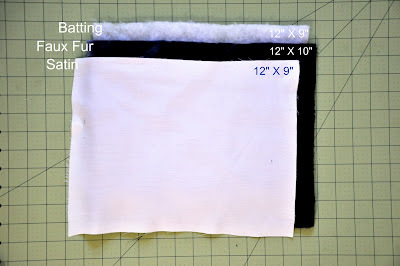 Fold the fur sides together, line up, and stitch, keeping the satin layer out of the way. Once stitched, press the fur seams open and under the satin with your fingers. Fold on side of satin over other, tucking under the raw edge. Pin and hand sew shut. Turn right side out and that's it!! Oooh i like that pleating idea! I remember missing one day at fashion school when they did permanent pleating theory and I was so frustrated because I really wanted to know! This would work amazingly! Does it wash out tho?